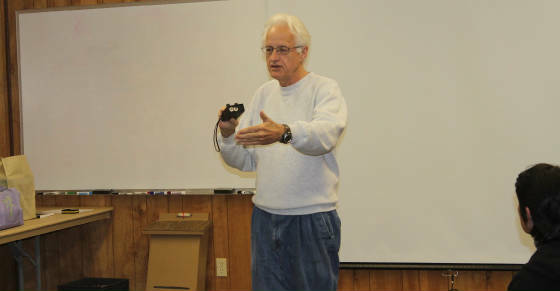 The 2011 annual NWFLEC meeting was held from Nov. 4th - 6th at Dogwood Acres Camp & Retreat Center. 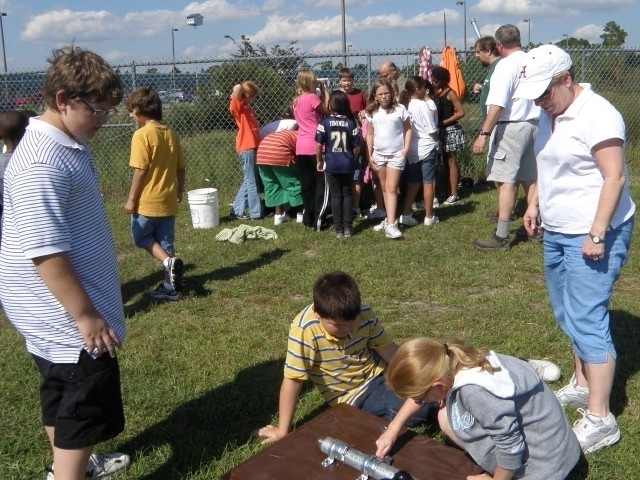 The activities were a great success and included a variety of educational and unique opportunites. 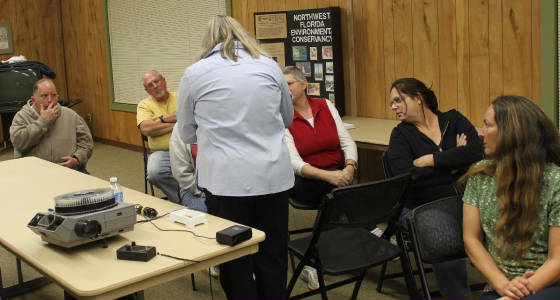 Renowned authors and authorities on Florida's bats - Cyndi and George Marks, gave an excellent program on bats and followed up with exciting bat activities afterwards! 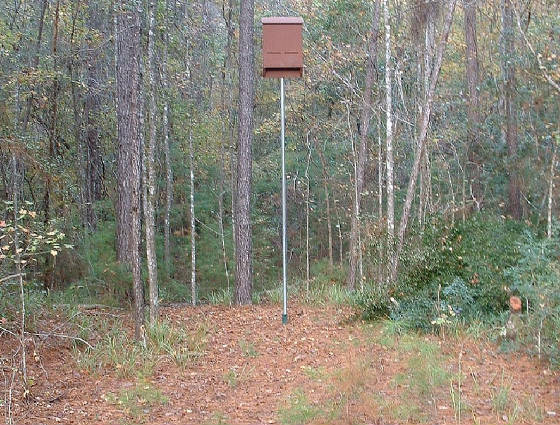 NWFLEC members also did environmental service projects at the camp removing old bat and bluebird houses, and also installed a new, deluxe bat house at the camp. Members were also given a tour of unique Steepheads and other habitat at the camp. Photos of the event are provided below. (Below) George Marks talks about the use of bat detectors. (Above) Cyndi Marks shows the audience a bat. (Below) The new bat house installed at Dogwood Acres. (Above) the new educational board! Completed by Tammy Matthews, with assistance from Karl Studenroth. Additional news is listed below. 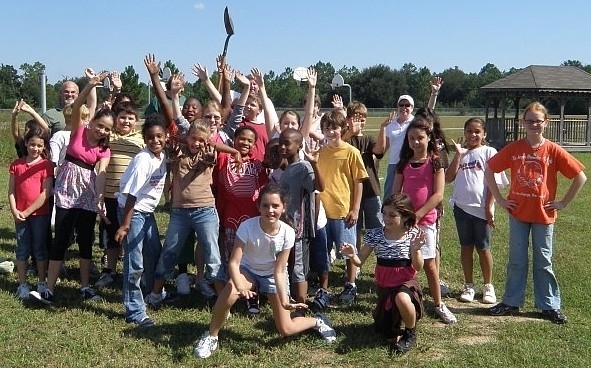 In October, 2010, students from Blue Angel Elementary School, who are members of the Big Lagoon Chapter of the Kiwanis Club, K-Kids program took on a project to help area bats! As part of environmental education efforts NWFLEC donated a bat house to Blue Angel Elementary School. Before the project Karl Studenroth gave a short program on bats, and he'll be returning later in October to talk more about bats and bring some furry flying friends along to visit the students! Kiwanis and NWFLEC members Maggie and Martin Haygood, along with NWFLEC secretary Tammy Matthews and Karl Studenroth oversaw the students as they had lots of fun helping to provide new roosting habitat for bats! Enjoy the photos below! (Above) Students in the foreground attach the bat house to the pole. Students in the background dig the bat hole! (Below) All the K-Kids students afterwards! 1) Recent, significant changes and reductions have been made to the NWFLEC website. 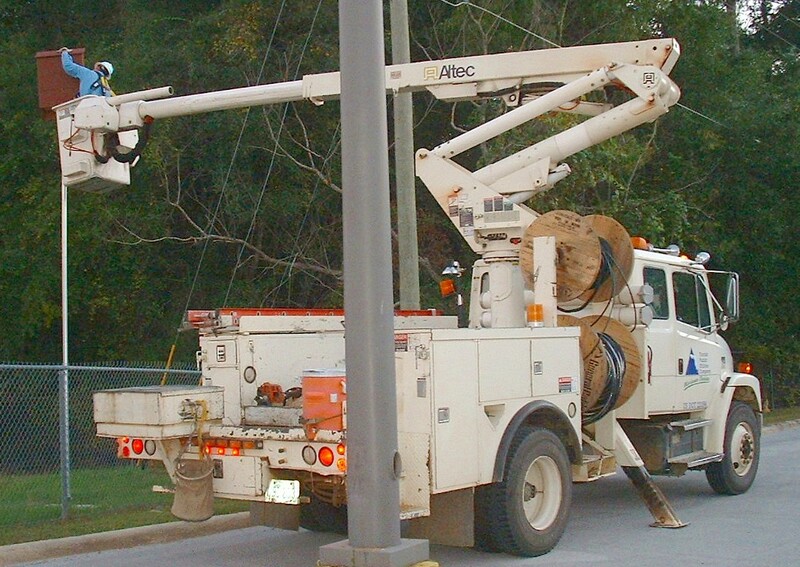 Material on this original site has been greatly reduced to make it easier to navigate this site and find basic information on NWFLEC. 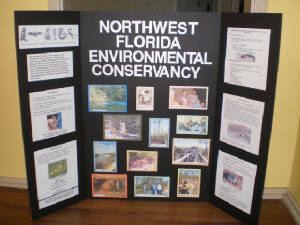 A second, supplementary NWFLEC website has been created entitled "Northwest Florida Environmental Conservancy, Part 2". This new site will specifically cover the unique and extraordinary biodiversity and natural history of northwest Florida and the adjacent Gulf Coastal States. This new site contains detailed information on the natural history of the northern Gulf Coatal area, and much of this information is difficult to find in one internet location. Extensive additional information will be added to the new site, including checklists of various groups of animals. A link to this new, NWFLEC supplementary website is found below. Enjoy the new site! 2) On Tuesday, May 1st a NWFLEC social and cookout was held at Karl Studenroth's house. Twelve people attended and everyone had a chance to see Karl's home zoo and some of the animals for the future nature center. Thanks to everyone who attended and helped out, especially Dennis and Christine Gilbert! 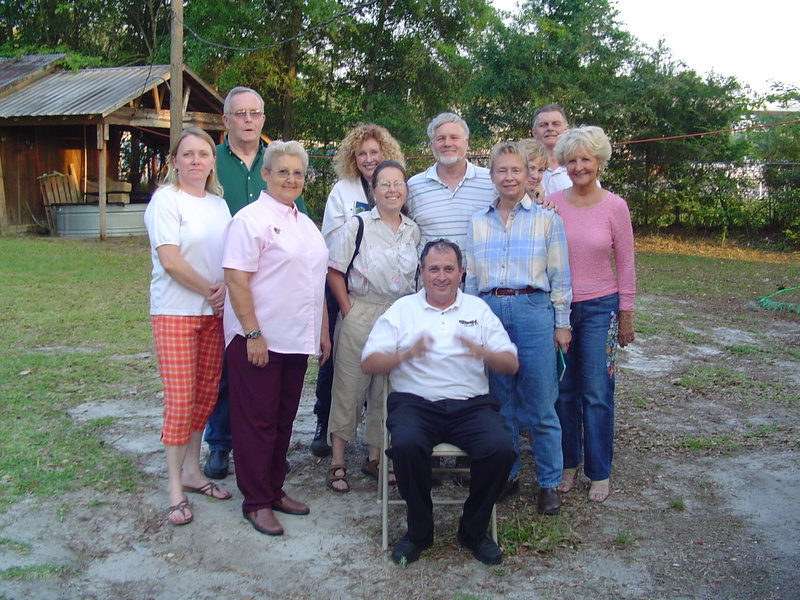 (Below) Pictured from left to right, front row: Sandi Chapman, Christine Gilbert, Mrs. Boothe, Royce Reagan, Sally Waxgiser, Rochelle Bearwood & Lois Jones. 2nd row: Dennis Gilbert, Cyndi Stewart, Billy Boothe & Brian Bearwood. It appears that Royce Reagan is conducting an orchestra! 3) In March, 2007 Karl Studenroth was hired to assist businesses at the Oak Station shopping center in Marianna, FL with problems with bats roosting and being found inside buildings. This project started under Chipola Environmental and Wildlife Services but quickly grew into other aspects. Through time NWFLEC and the Florida Bat Conservancy became involved with the bat roosting issue. Over time the bats were slowly excluded from their roosts. Simply, one-way devices were installed that allowed the bats to leave the roost but not return. I'd like to recognize and commend the Oak Station, LLC for dealing with the bats in a humane and environmentally friendly way! I'd also like to thank numerous businesses for their support and patience, especially Goodwill and Sears! We're now pleased to announce that the Florida Bat Conservancy (and NWFLEC scientific advisors) has purched a bat house and related materials for the Oak Station shopping center! We wish to extend a special thank you to the Florida Bat Conservancy! The bat house has now been installed at the Oak Station Shopping Center in Marianna, FL! I'd like to thank Joe Retherford for making arrangements with FL Public Utilities to finally get the bat house installed. I'd also like to thank Rhondon Gray and Kevin Harris of Florida Public Utilities for instaloing the bat house! Now, we're trying to raise the funding ($425) to install an educational sign next to the bat house. Once we have the educational sign completed and installed, and the fence reconnected, we'll be having an official bat house grand opening event! Announcements will be made soon for the bat house grand-opening event. (Above) The bat house is being installed by Kevin Harris & Rhondon Gray of Florida Public Utilities. (Below) The bat house after installation. The bat house will hold up to 400 roosting bats! 1) On Tuesday, April 17th Karl Studenroth filmed a new episode of "Outdoors with the Northwest Florida Environmental Conservancy". This new episode is on turtles of northwest Florida. Turtles within the Florida Panhandle are among the most diverse in the entire nation and at least 25 species are found here. Panhandle turtle diversity ranges from sea turtles, snapping turtles, soft-shelled turtles, aquatic turtles, box turtles, gopher tortoises, plus many other species. Dr. Dale Jackson, from the Florida Natural Areas Inventory, appeared on this program, and numerous turtle species were discussed and shown. This program has already aired a few times, and it will air again on Wednesday, April 25th, at 7pm CST, on Marianna Comcast cable channel 4. Additionally, a special airing of this program is available on the internet, from Chipola College at the same time and date above. To watch this program online follow the two instructions below. Special thanks to Sandi Chapman and Royce Reagan who were behind the scenes filming and editing these programs. We also thank Dr. Dale Jackson for being our special guest star and turtle expert. 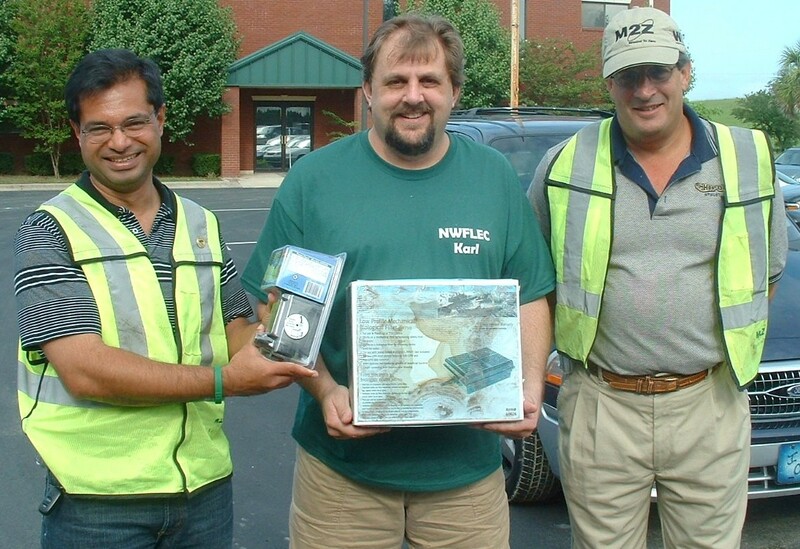 Dale is a NWFLEC scientific advisor. Many people have a unique fondness and love for turles, and they are very ancient and incredible animals! Be sure to tune in for this upcoming program! B) Click on: "To watch the current video webcast from CCTV, click here." 2) On Wednesday, February 14th Karl Studenroth filmed two new episodes of "Outdoors with the NW FL Environmental Conservancy". These episodes focused on Sandhills of Jackson County Florida. The first episode was on Upland Sandhill Ecology, Plants & Fire; and the second episode was on Upland Animals and Conservation. These programs aired several times throughout February and March and will air again occassionally on Marianna, FL Comcast cable channel 4. Special thanks to Sandi Chapman and Royce Reagan who were behind the scenes filming and editing these programs. These programs shed light on the incredible diversity and importance of Upland Sandhill ecosystems. I hope these programs will encourage future new members and support of NWFLEC. 3) In August of 2006 officials from Waste Management's Springhill landfill donated a new water pump, water filter and a large cattle tank to temporarily house "Tommy", the large Alligator snapping turtle NWFLEC has for a future nature center exhibit. (Above) Karl Studenroth accepts a water pump and filter from Mr. Achaya Kelapanda that Waste management purchased for NWFLEC for "Tommy" the Alligator snapping turtle! 4) NWFLEC received some exciting and unexpected publicity recently! A new book on Bats of Florida has just come out by our advisors, Cyndi and George Marks. On the back cover of the book NWFLEC is mentioned! Thanks a lot Cyndi & George! A review of the book can be found at the following link, where you can also purchase a copy: http://www.upf.com/book.asp?id=MARKSF06. 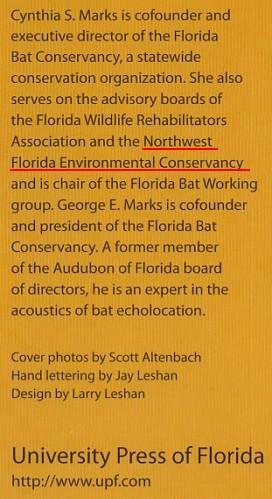 (Below) NWFLEC was recently mentioned on the back cover of the new Bats of Florida book! 5) Friday, November 17th, 2006 at Chipola College, Marianna, FL. Royce Reagan and Karl Studenroth filmed a new local cable TV show on "Caves and cave life of the Jackson County area". The new program on "Caves and Karst of the Jackson County Area" will first air Wednesday night, November 22nd, at 7pm CST, on the local Marianna Comcast cable channel 4. This show will air again, periodically at different times, in the days and weeks to come. This show is part of a new series of at least five upcoming shows on the biodiversity of Jackson County and the surrounding region. Past shows were done on bats, snakes, carnivorous plants, and various aspects of local biodiversity. The upcoming shows will be on 1) Caves of the Jackson County Area; 2) Springs of the Jackson County Area; 3) Rivers, Streams & Wetlands of Jackson County; 4) Sandhills of Jackson County; and 5) Biodiversity and the Ecological Importance of the Jackson County Area. 6) A great deal of material was covered at the NWFLEC Board meeting on September 12th, 2006. One of the items was the temporary appoinment and approval of new NWFLEC officers and positions. These new positions and individuals are listed below. Also, after 21 months, Dr. Steve Shimmel stepped down from the NWFLEC Board to pursue numerous other conservation activies and a full teaching load as a professor at Chipola College. We sincerely thank Dr. Shimmel for all his help and support of NWFLEC, and for being a lifetime member! Lastly, Royce Reagan, of Chipola College has volunteered to serve on the NWFLEC Board! Royce is Director of TV & Video Productions at Chipola College and brings a great deal of experience and expertise to the NWFLEC Board. We wish to extend a special thanks and welcome to Royce reagan! Another Board meeting was held October 16th. Additional progress was made at this meeting. Details of that meeting will be posted soon. 7) Karl Studenroth has started a list of caves of Jackson County and the surrounding regions (the Marianna Lowlands & Doughtery Karst Plain). In this inventory I want to document: the status of each cave, ownership; what history is known of it; what wildlife utilizes each cave with emphasis on rare and endangered species. So far we've documented 79 caves! If anyone has any information on caves of the FL Panhandle or adjacent Alabama or Georgia, please contact us! 8) A natural history and ecological library has now been established for NWFLEC work, research and members. We now have 100+ books, brochures, papers and maps. If anyone has any extra natural history books or materials, feel free to donate them to the NWFLEC library. to aid in obtaining our State non-profit status, and becoming NWFLEC lifetime members! for NWFLEC and the future nature center! Tommy and Joal Clyatt are amazing and long time friends of mine! In 1987 I founded the Florida Panhandle Herpetological Society, and Tommy & Joal were among the most supportive and active members. Since then I had kept in touch with them over the years, and visited them from time to time when I was doing wildlife research in their area, and we remained good friends over the years. 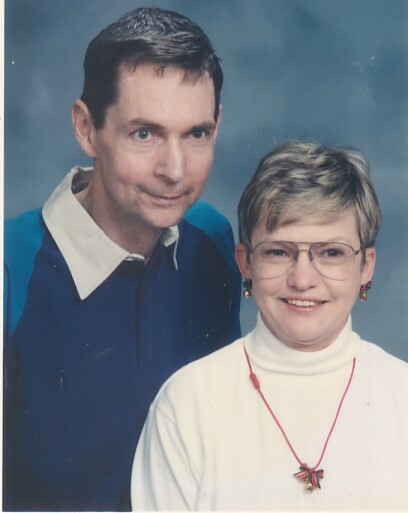 Unfortunately, Tommy, Joal's husband passed away about two years ago now. I was deeply saddened by this news, but kept in touch with Joal. When I founded the NWFLEC, Joal was one of the first members to join, and also became a lifetime member! Sometime after becoming a member, Joal contacted me and asked me if NWFLEC would be interested in adopting a large Alligator snapping turtle that her husband had raised. Tommy had raised the turtle for 26 years, since it was a small juvenile! In honor of Joal's husband, I have named the large turtle "Tommy"! In the future, the large Alligator snapper will be one of the center pieces and highlights of the NWFLEC nature center! I sincerely thank Joal for the donation of the incredible turtle and for all her support of NWFLEC! I'm also honored to have the chance to display the awesome turtle in our future nature center. The turtle will play a crucial role in NWFLEC environmental education efforts and I'm sure it will certainly make quite an impact on visitors. I'm also indebted to Tommy Clyatt for raising such an incredible turtle for so many years, with such love and care for the remarkable animal! I will greatly miss my late friend Tommy, but his love and committment for wildlife lives on through his wife Joal, and will impact many people for many years to come through his incredible Alligator snapping turtle! Thanks Tommy! (Above) Alligator snapping turtle (Macrochelys temmincki). This is the actual turtle that WE NOW HAVE! 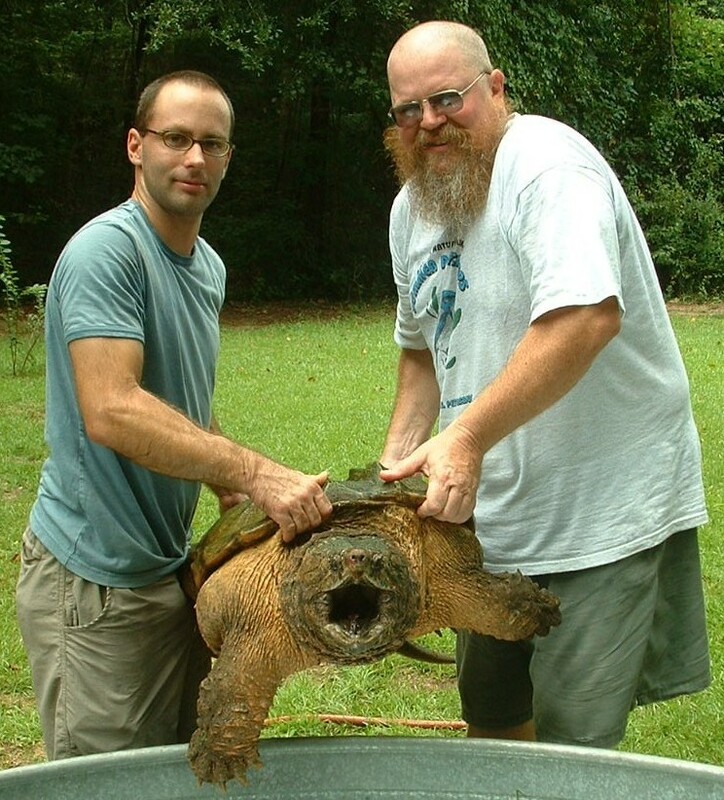 The Alligator snapping turtle has been named "Tommy", in honor Joal Clyatt's late husband. Pictured with Tommy are Tim Walsh & George Heinrich of the Florida Turtle Conservation Trust. (Below) Tommy & Joal Clyatt. Joal is a lifetime NWFLEC member & supporter! 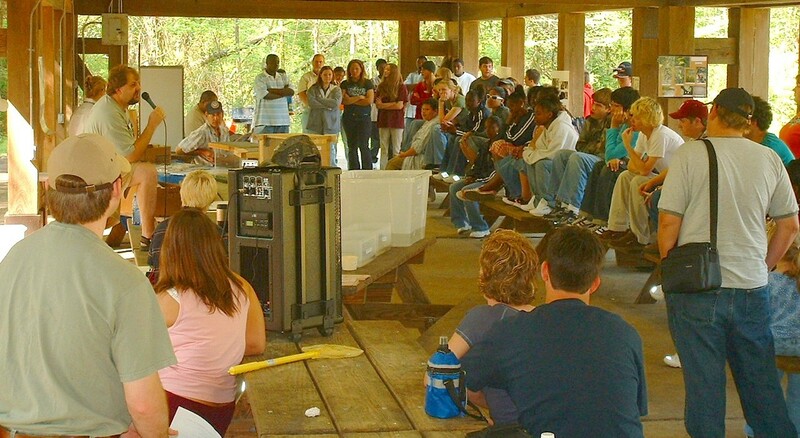 (Above) Jackson County High School students attend a wildlife presentation at the Wildlife Day. 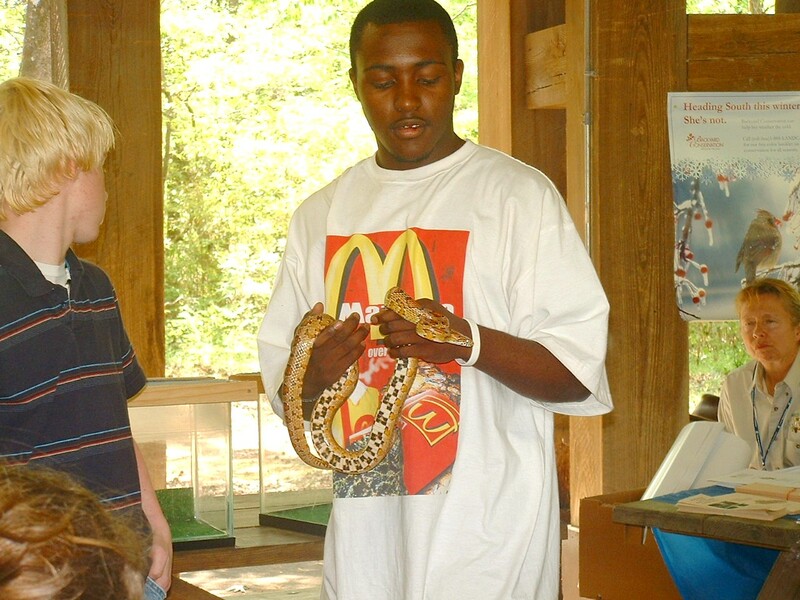 (Below) A Jackson County High School student holds a large Corn snake (Corn Dog)! Additionally, presentations were also given through May at Blountstown Middle School, Wewahitchka High School and at the "I Can Grow" National Youth Service Day, in Cottondale, FL. Wildlife Day and all of these presentations were made possible by a grant from the Florida Fish & Wildlife Conservation Commission, provided by the Chipola River Partnership & Gary Latham. Many individuals made these events and presentations possible, and special thanks goes out to: Gary Latham, Brian & Rochelle Bearwood, Brain Fugate and the staff of FL Caverns State Park, Sandi Chapman & Justin Hulsey, Dr. Jeff Bodart & students of the Chipola College Science Club, Brian Branciforte (FL Fish & Wildlife Conservation Commission), John Valenta (Northwest Florida Water Management District), Sally Waxgiser (Jackson County Master Gardeners), Donna Peacock, Chad Taylor & Dr. Steve Shimmel! 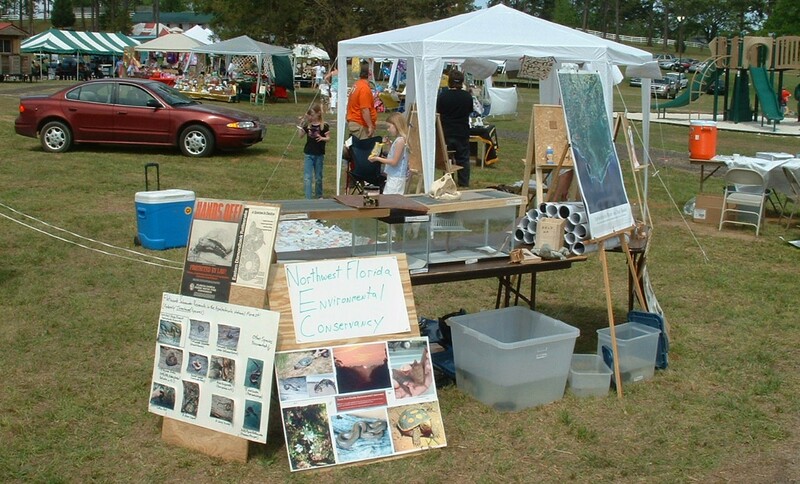 On April 7th, 2006 a NWFLEC booth was set up at the "FINE SWINE & DINE Festival" at Citizens Lodge Park, in Marianna, FL. (Below) The NWFLEC booth at the "FINE SWINE & DINE Festival".